Winethropology: Aged White? Yes, Yes, Yes! Aged White? Yes, Yes, Yes! 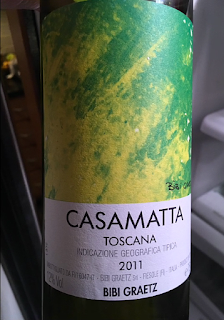 Vermentino was an all but unheard of grape a few years ago, and still remains largely sheltered from the main stream wine drinking community's view. Indigenous to Saridnia and Tuscany, vermentino makes bright, expressive whites that sing sunshine in an infatuating, lilting accent. Since first tasting one on a trip to Italy in 2000, I've been drawn-in by its allure. Fruity, yet finishing dry, and with a whisper of acidity, vermentino wins on delicate balance. If you can conjure an image of a seafood pasta lunch on a wisteria-canopied balcony, then you're more than halfway to imaging what wine made from this grape tastes like. mixed case ($120, including delivery) scratched my itch for finding new discoveries while fitting into the budget. But when I saw the vintage, my hopes for brilliance were tempered by the likelihood that now, fully five years old, the wine was skunked. Thankfully, it was not. In fact, not only had it survived, but possibly improved. Honeyed by age to an amber shade of gold, the 2011 Bibi Graetz Casamatta Toscana Bianco ($10) didn't so much retain its exuberance as evolved into something with elegant vigor. Still in possession of all its attractive qualities and athletic focus, the allure of the wine seems to have deepened and intensified with age. Glorious, irresistible, and, sadly, gone. Of course, not all wines, whites or reds, have the same capacity to age youthfully, but I'll be slower to make assumptions in the future.